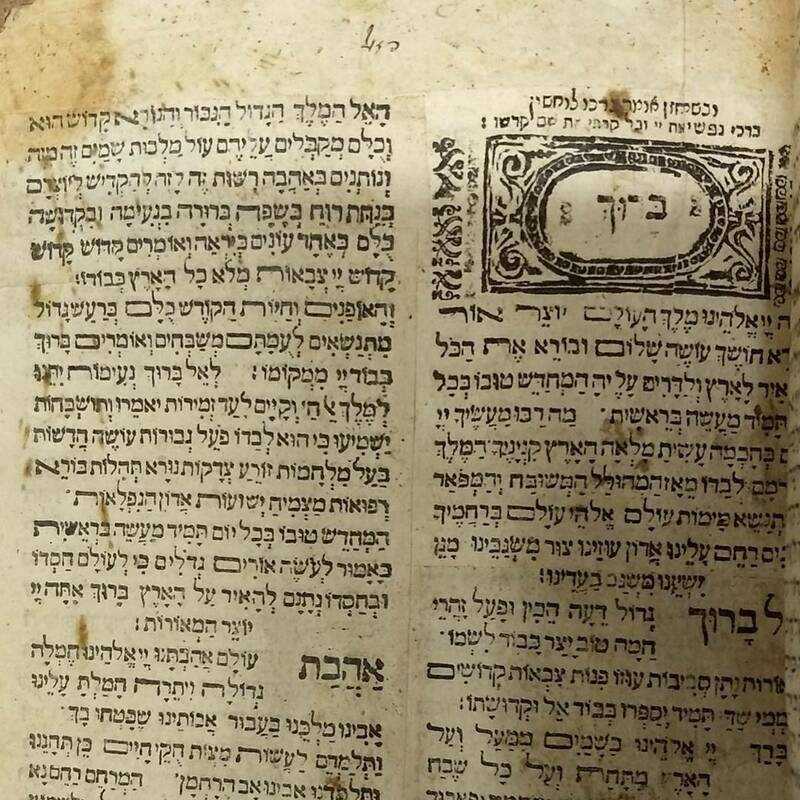 Between the years 1557 and 1559, the printer Ya’akov Kohen mi-Gazolo worked on producing a mahazor, the standard Jewish prayerbook which included prayers for all holidays, in two volumes, in his Mantua printshop. He produced two editions of the prayerbook; one in large format (folio), perhaps for the prayer leader, and one in smaller format (octovo) for personal use. 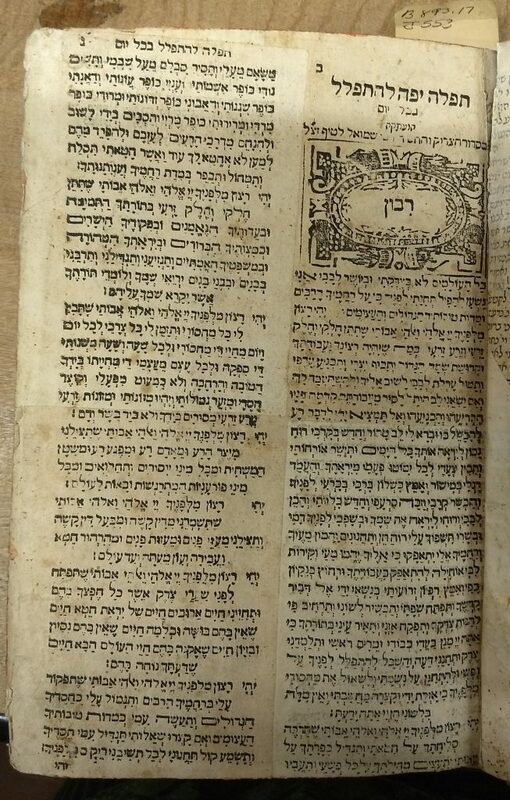 Interestingly, Ya’akov used the same plates to print both the large and small format books, perhaps to save on typesetting costs. 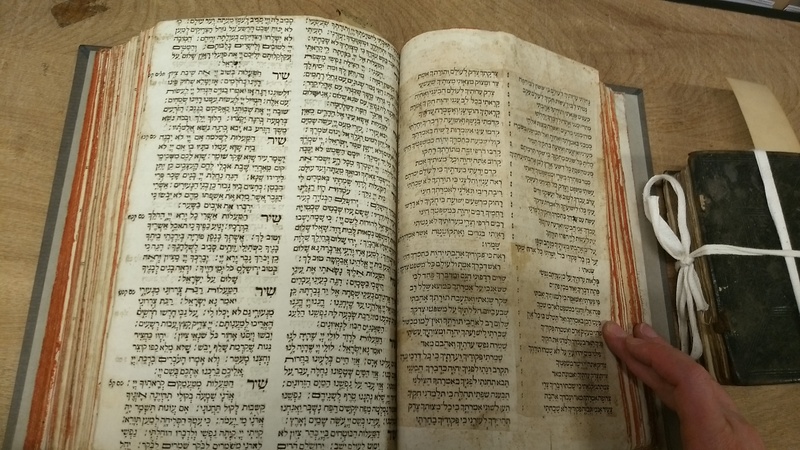 Instead of having to reset the entire book to fit the larger page, Ya’akov simply printed the large format book in two columns, so he could use the type that he had set for four separate pages of the smaller version to fill a single page of his larger version. 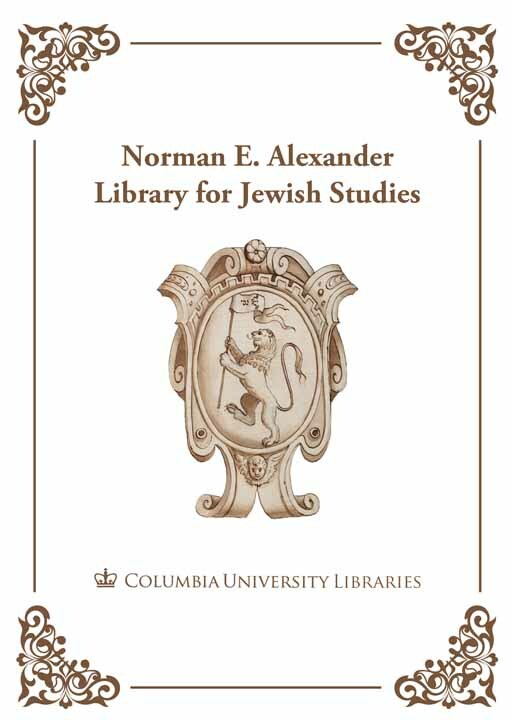 Columbia’s copy of the title consists of one of each: the first volume is present in the large format (below, open), and the second, in small format (below, closed, on the right). Volume 1 of this copy, however, is most unusual. It seems that the owner of the first volume realized that his prayer book was missing the first eight leaves. Clearly not having access to additional leaves of the large format volume with which to replace them, this owner took two copies of the small format volume and pasted them together to form the large sized page. Page 1 was pasted above a copy of its verso, in order to allow the text to flow directly to what would have been (in the small format) page two. 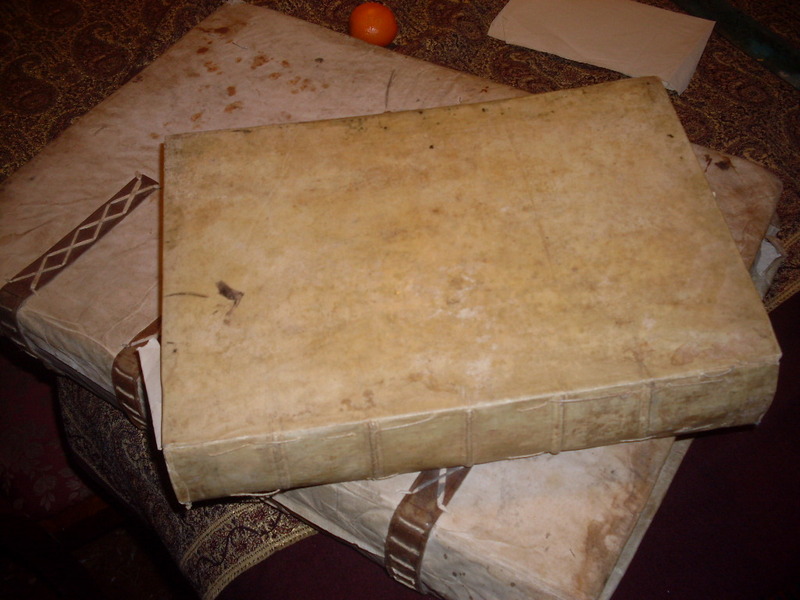 Once the owner reached the eighth leaf of the book, where his large format copy began, he was able to cease his work (hence the differing colors in the leaves in the picture above – one has glue under the page and one does not). The book was censored by the famed Jewish convert and censor Domenico Irosolimitano, in Italy. 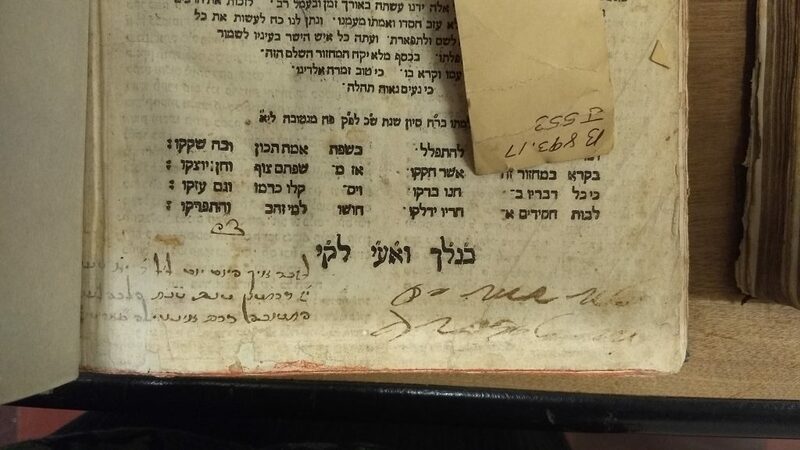 Next to the censors’ mark is an inscription of an owner, who notes the date (17 Heshvan) and year (unclear) that he purchased the book. Was this the same owner who creatively* re-used additional copies to repair his own? Unfortunately, a modern rebinding of the book obscures the complete owner’s inscription, and so we are left wondering. *Disclaimer: Columbia University Libraries does NOT condone the ripping apart of books to repair other books. This entry was posted in Uncategorized on August 28, 2017 by Michelle.